Beautiful well maintained & cozy, this sweet year around updated bungalow is move in ready. Vaulted ceilings make this space feel & look spacious.The yard is unbelievably stunning, fenced back yard, raspberry bushes, strawberries, rhubarb, perennials galore. A wrap around composite deck allows ample room for entertaining. 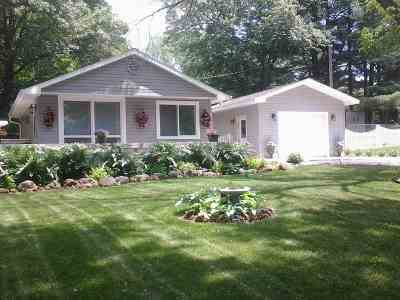 Located in a desirable friendly neighborhood with lake view & public lake access just steps away. 5 miles to Devils lake, Devils Head skiing/golf & 25 mi to WI. Dells. Newer roof, garage, updated electric/plumbing. Home? Vacation? Building site? Downsizing? Lake living w/o lake taxes-This is it! !